The collaborative art team of Ethan Bach, J Craig Tompkins and Charles Veasey are pleased to announce that The Royal Road Project has been accepted into two shows in early 2015. This interactive media installation has been traveling since 2012 and continues to captivate viewers. The Royal Road Project will be exhibited as part of the Staff and Faculty Show at the Institute of American Indian Arts at the Edge Gallery, 83 Avan Nu Po Road, Santa Fe 87508 and will run from February 26 through March 26, 2015. The Royal Road Project then journeys down I-25 to exhibit as part of the Experiments in Cinema Festival at the Guild Cinema Lobby at 3405 Central Ave NE, Albuquerque 87106 and will run April 15 – 19, 2015. Then this project about the Southwest heads to Seattle to partake in the Seattle Transmedia & Film Festival from May 1 – 9, 2015. The Royal Road Project premiered at the the Centennial Project Space in Santa Fe, New Mexico and two projectors to map the video to meet in the corner of two adjacent walls. The the artists premiered a customized panoramic monitor which offers a plug and play ease of use that incorporates the interactivity of the original piece for the showings at Aqua Art: Art Basel Miami. The piece has also shown at New Mexico State Arts at Bataan Memorial Building, CURRENTS: Santa Fe International New Media Festival, and for Composites at Science Museum of Oklahoma. Installation media art has never been so sleek and easy. The Royal Road Project is create to be an easy and durable interactive video installation. The custom panoramic monitor is sharp and eye catching. The custom made software allows the installer to simply hook up the components and start the computer. Everything starts up and you have your very own interactive piece of digital art. This LED backlit monitor is 38″ long and 9.5″ high with 1080p resolution (just half as tall). 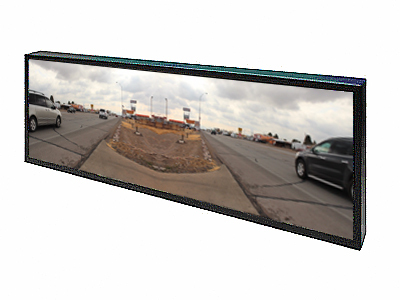 The monitor is perfect for panoramic video images, complimentary side-by-side video, and juxtaposing video clips to add dimensionality to the video image. The design is sleek and the image is sharp. We went all out with the equipment to deliver the best quality of electronics in this installation. Below is a description of what comes with the installation along with the pano monitor. Mini Computer with custom software for playback and interactivity. We also include all necessary cables. For more information about The Royal Road Project, please visit the link. To inquire about scheduling the work for a show or sales, please contact Ethan Bach at ethan@ethanbach.com. Limited Edition.